Prof. Horace H. S. Ip is the Chair Professor of Computer Science and the founding director of the AIMtech Centre (Centre for Innovative Applications of Internet and Multimedia Technologies) at City University of Hong Kong. He received his BSc (Hons) and PhD degrees from University College London (UCL), United Kingdom, in 1980 and 1983 respectively. He was the Head of the Department of Computer Science from 1997-2003; the Interim Dean of the School of Creative Media in 2008-2009; and the Interim Vice-President (Research & Technology) in 2009-2011 and 2012-2013. Professor Ip's research interests span image analysis, interactive media, virtual environment and e-Learning technologies. He has pioneered innovative interactive media technology for visual art, psychotherapy, Chinese calligraphy, and e-learning. His research and innovations in these areas have won him and his team regional and international awards which include a Gold Medal from the Salon International Des Inventions, Geneva, Prix Ars Electronica, Austria; the Asia-Pacific Information and Communications Technology Award (APICTA); and the CityU Applied Research Excellence Award. In 2007, Professor Ip was recognized as one of world's innovators by the TIME magazine. In professional education, Professor Ip is actively involved in the promotion of Information Technology in teaching and learning, quality education, and professional practices in engineering. He had served on the Steering Committee of the HKSAR Quality Education Fund (QEF) and chaired its Dissemination and Promotion Subcommittee. To promote quality education, Professor Ip chairs the Assessment Working Group for the HKSAR Chief Executive Awards for Teaching Excellence and serves as a member for the Education Bureau Committee on Professional Development of Teachers and Principals (COTAP), and the Advisory Committee on the Education Development Fund. 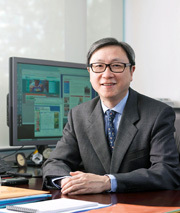 In serving the community, Professor Ip served on the Editorial Boards of major learned journals in multimedia and computer graphics including the IEEE Transactions on Multimedia, Pattern Recognition (Elsevier), The Visual Computers (Springer). He is also a founding editor for the International Journal for Multimedia Information Retrieval (Springer). Professor Ip was a Council member of the Hong Kong Computer Society and also chaired the IEEE Computer Chapter (Hong Kong Section) and the Hong Kong Institution of Engineers (HKIE) Discipline Advisory Panel on Information Engineering (INF). Professor Ip is a Fellow of the Hong Kong Institution of Engineers (HKIE), a Fellow of the Institution of Engineering and Technology (IET) in the United Kingdom, a Fellow of the British Computer Society and a Fellow of International Association for Pattern Recognition (IAPR) .